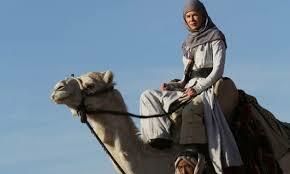 Werner Herzog’s Queen of the Desert ambles, utterly directionless, through the life of Gertrude Bell, who paved the way for cooperation between officials of Middle-Eastern governments and British colonialists by way of mapping out the regions of Arabia, Mesopotamia, Greater Syria, and Asia Minor. She was also a writer, a spy, and an archaeologist, living a full life for having had only 57 years of it before her death, two days before her 58th birthday, in July 1926. The film fails to provide any of this important context, which has been gleaned from encyclopedic accounts of her life that are more insightful than anything found onscreen. Yes, this is one of those movies in which the written coda that leads into the credits tells us more about the movie’s subject (and, certainly, about the people she encountered) than the actual movie that proceeds it. What transpires amounts to a transparent doodle, a scribbled account of a few events that regard her life as having been lived between romances with two men and a flirtatious series of exchanges with a third. There is no sense of a life here, and the film is utterly impenetrable in its attempts to find some sort of central focus. Bell remains a cipher, and the figures of historical record whose paths she crosses are mere avatars within her vicinity. Bell is played by Nicole Kidman in a performance that can be politely described as wooden, although one can detect that the actress is utterly lost in the weeds of Herzog’s screenplay, which provides a mixture of expository dialogue and whispered, ponderous narration. Joe Bini’s editing shifts between timelines with such abandon that it’s less a fluid progression than a random collage of moments without much in the way of context. We begin on her whirlwind romance with and marriage to Henry Cadogan (James Franco, sporting an awkward English accent on account of replacing the role’s original performer at the last minute), Viscount Chelsea and a British Army officer. His mysterious death, which has never been solved, would go on to haunt Bell for the rest of her life. The film is too happy, though, to rush through the other pieces of Bell’s life to dwell on matters such as the death of the man she considered the love of her life. Soon, she has sworn off all other potential romances to wander the desert terrains of the Middle East, in which she aids in developing the borders between regions that are now known as the countries of Iraq and Jordan (An encounter with T.E. Lawrence, played by Robert Pattinson in a tired impression of Peter O’Toole, seems to be paying lip service to the real-life exchanges, making the scenes seem awkward and shoehorned-in). The development of this relationship was in collaboration with Winston Churchill (Christopher Fulford), but the collaboration is hardly the point, the film argues, when Bell has fostered another romance with Charles Doughty-Wylie (Damian Lewis), another Army officer.